This product review focuses on Clarins Stretch Mark Minimizer. This product claims to decrease stretch mark appearance during pregnancy and after quick weight loss. It also claims to maintain a supple, smooth, and healthy skin. Your will learn more about this product as you read further. Use radial massage movements to apply the product on the targeted areas. Concentrate on areas where striae are likely to occur such as hips, thighs, breasts, lower back, and abdomen. The price of one tube (6.7 oz) is $52.00 on the company’s official site. After comparing this price with the prices of similar products in the market, we found out that this product is overpriced. Overpricing may hinder potential buyers from purchasing the product. The manufacturer is committed to ensuring that customers are completely satisfied when shopping on the official site. In this respect, product returns are possible and should be done within thirty days after the shipping date in order to receive refunds. However, this guarantee is a bit different because users can only return unused, defective, and damaged products. Therefore, to some extent, there is no 100 percent satisfaction guarantee. Users can only ascertain that the product is effective by opening and using it. Therefore, given that users cannot return opened products, the company’s guarantee does not assure consumers that they will be satisfied. We also conducted a research on the experiences of buyers who have tried the product. We found mixed reactions from users. Some customers have expressed their satisfaction while others have expressed their dissatisfaction. Based on the information we gathered during our research, it is evident that this product contains a wide range of ingredients. These ingredients are known for their ability to minimize striae appearance. Users have the discretion to purchase this product, but we recommend that you should try products that have detailed information and positive reputation. We identified some benefits that may attract potential users to try this product. For example, there are some positive testimonials from individuals who have tried to minimize stretch marks with this product. Furthermore, this product contains many trusted ingredients making it a potential remedy for stretch marks. However, we have found several limitations that might cause quality-related issues. For example, although some customers are satisfied with the product, other customers are not happy with the results. Furthermore, we are concerned that this product is overpriced. Overpricing is likely to prevent potential customers from buying the product. Moreover, although the manufacturer claims to ensure customer satisfaction, customers cannot return opened products. 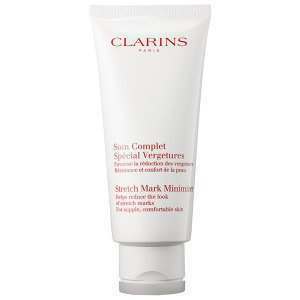 David Carney	reviewed Clarins Stretch Mark Minimizer	on August 15th	 and gave it a rating of 3.